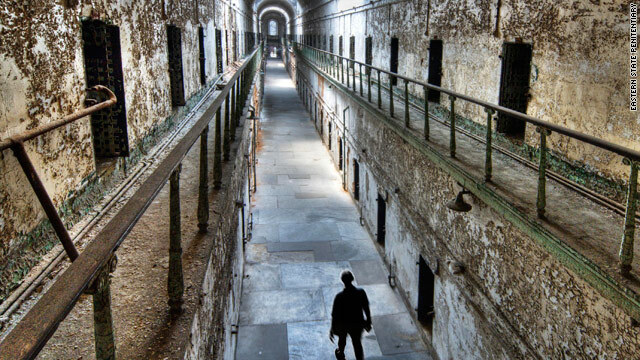 Atlas Obscura enthusiasts are more likely to visit Philadelphia's historic Eastern State Penitentiary than the Liberty Bell. Atlas Obscura Web site highlights "world's wonders, curiosities and esoterica"
(CNN) -- When Joshua Foer and Dylan Thuras met, they knew immediately that theirs would be a friendship based on wonder and curiosity. Atlas Obscura, their recently launched Web site, is a testament to that belief. A Wikipedia-style user-generated site, Atlas Obscura says its mission is to highlight and reveal "the world's wonders, curiosities and esoterica" through an integration of travel and Web. "We had been talking about some kind of resource like this, pretty much since we met, and then I spent a year in Hungary traveling, going to these strange places and writing" a travel blog, Thuras said in an e-mail. Foer, a freelance science journalist recently relocated to Connecticut from Brooklyn, New York, and Thuras, a director/video editor who still resides in Brooklyn, launched the site upon Thuras' return stateside, allowing users to submit articles to a panel of volunteer editors who then vet and publish the pieces. The site is receiving 200,000 unique visitors per month. Now Foer and Thuras have organized a day dedicated to their vision. Obscura Day, taking place Saturday, aims to incorporate the site's mission into a day of collective global pilgrimages. Capitalizing on the vast network of users the site has accumulated -- through the use of social media sites such as Facebook and Twitter, as well as a rabid networking campaign -- they've been able to coordinate day trips guided by volunteers around the world. Go to atlasobscura.com/obscura-day to sign up for Saturday's events. The organized events are as far-flung and disparate as their locations. About 200 people have committed to a trip to California City, California, a planned city in the middle of the Mojave Desert that was never finished. It is now home to about 15,000 people, many of whom live within a surrounding network of crumbling roads, the vestiges of the abandoned city plan. In Belgrade, Serbia, an expedition will be led to famed scientist Nikola Tesla's eponymous museum, and in Dunedin, New Zealand, explorers will visit the Beverly clock, which is powered only by changes in atmospheric pressure and temperature. Established in 1864, the clock is one of the world's longest running science experiments. The initial role of Atlas Obscura was not only to uncover the world's overlooked and underappreciated intrigues but to counteract what Foer and Thuras felt was an increasingly homogeneous tourist culture. "There are so many amazing, fascinating, wondrous places in the world that most people just don't step foot in or bother to seek out. Florence, Italy, is a great example, where the tourists all tend to go to the same five places," Thuras said. To Obscura enthusiasts, Philadelphia's Liberty Bell is just a broken piece of copper and tin. A real attraction in Philly is the Eastern State Penitentiary, a spectral urban prison that once housed Al Capone, among many others. And in Brussels, Belgium, the chocolates and beers are nothing more than a tasty accompaniment to Mini-Europe, a theme park featuring miniature, 1:25 scale models of monuments in the European Union, an ironic twist on the Atlas Obscura theme of avoiding popular landmarks. These are just two of many examples of articles that pop up on the site. "Our goal is not merely to catalog these incredible places, but to get people out in the world exploring them. Too often the sorts of spots described in the Atlas are under-appreciated and under-celebrated. And too often, they end up closing their doors," Foer said via e-mail. "Our mission is to celebrate these places, and hopefully help preserve them. We like to think of ourselves as UNESCO's weird little brother." The friends are quick to point out the essential role social media play in sustaining a thriving fan base and attracting participants for Obscura Day. "The Atlas is the creation of a network of far-flung contributors. I'm not sure if we'd have had the success we've had without Facebook and Twitter, which are our main tools for staying in touch with, and growing, our community," Foer said. Marina Popovic, 29, organizer of the Obscura Day tour of the Nikola Tesla museum, found out about the site through Twitter. "This is a truly open online collaborative network manifesting as a set of explorations in the real world, and I'm proud that Belgrade is a part of it," said Popovic, a Belgrade architect. With a few exceptions, the response to Obscura Day has been positive. Bureaucracy and politics crushed an event in Syria, where plans to visit the Damascus Bimaristan, an Arab science and medicine museum, were scrapped over concerns that retaliation against organizers would be staged based on Atlas Obscura's involvement with an event in Israel. "I think the place with the fewest RSVPs is our event in Havana, Cuba. But that's only because most Cubans don't have access to the Internet. We happen to know that there will be people there. Also, the Iceland Phallological Museum in Husavik has only two RSVPs, but it's in a tiny little town four hours north of Reykjavik," Foer said. When Foer and Thuras started the site, they wondered whether there would be enough curiosities to sustain it. But the doubt was unfounded, Foer said. "When we started the Atlas, we feared there'd be only a limited number of wondrous and curious places in the world for people to catalog. So far it's turned out we were wrong. We get new, incredible places pouring in every day."